Q. "How does the Hair Growth Formula PLUS+ by MY Hair Secret work and why is it different to other hair care vitamins?" A. Hair thinning is a problem many of us experience. It can be quite traumatic because our hair is one of the first things people see. In those first few seconds of judgement, your hair plays a key role on how you are perceived. Having a full head of healthy hair can help you feel and look more youthful and confident, so when you suffer from hair problems, this confidence can be depleted. There are many reasons we may see a decrease in the amount and/or quality of hair we are producing. Hormone imbalance, medication, stress, unhealthy lifestyles, poor hair care, hairstyles that damage hair or the scalp and medical conditions are some of the reasons we may experience poor quality hair growth. Each hair follicle has its own blood supply and if the hair growth cycle is disrupted or the follicle has shrunk, there can be a restricted supply of blood and nutrients to the follicle. The hair growth cycle can be disrupted by a stressful event, shock, illness or a difficult period in your life. It is reported that one of the main reasons for hair thinning, especially as we age is an increased sensitivity to a hormone called DHT (5α-Dihydrotestosterone) which attacks your hair follicles, causing them to shrink and produce less hair than before. Don't dismay, there are things that you can do to try and rectify the issue. 1. Get to the Root of the problem naturally. The research behind the formula stems from a worldwide conclusion made by Procter and many other Scientists and Trichologists that there is a link between hair loss and a hormone called Dihydrotestosterone (“DHT “for short). To understand how the Hair Growth Formula PLUS+ works you need to understand this link.​The male hormone, Testosterone is metabolised into DHT by an enzyme (5a reductase). The DHT then binds to sites at the hair follicle. DHT is also involved in benign prostatic hyperplasia (enlarged prostate) and prostate cancer. Although it is a male hormone, women still have some, albeit not as much. This may be why men suffer from pattern baldness commonly more than women. As we age, our Testosterone levels may go down and the Dihydrotestosterone levels increase. There are many theories as to why DHT is thought to be linked to hairloss. It could be that an increase in the sensitivity to the hormone causes the hair follicle to miniaturise. When the follicle is shrinking, less hair can grow out of it and the blood supply is diminished. 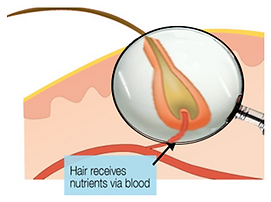 This means that fewer nutrients can reach the follicle causing any hair to be weaker and thinner. It is thought that sensitivity to this hormone is hereditary, which would explain why some of us share baldness/hairloss patterns with other family members. (“Thanks for hair line Dad!” ). The Hair Growth Formula PLUS+ includes a unique blend called “Lustalox”. It is in this blend that ingredients reported to help protect the hair follicle from DHT attack exist. It does this by inhibiting the formation of the enzyme required to convert Testosterone into Dihydrotestosterone. 2. Stimulate hair growth naturally. By taking the Hair growth formula PLUS+, you will be infusing your blood withfantastic nutrients. Once they get to your hair follicles they can start work on helping maintain healthy hair growth. To help the nutrients in your blood reach the hair follicle, we recommend conducting a daily inversion method scalp massage for one week each month and keeping the scalp clean and healthy with an antibacterial, kind shampoo, such as one containing Tea tree oil. This creates a great environment for your hair to grow. As well as the action on DHT, the Hair Growth Formula PLUS+ also contains nutrients at a specific level that we have established to be perfect for helping maintain healthy, strong hair growth. It is packed full of nutrients and antioxidants reported to help protect against free radical damage and reduce inflammation. Nutrients such as: Biotin, a well known ingredient reported to help promote healthy hair and nail growth; Copper, which has antibacterial and healing properties, perfect for those wanting to maintain a healthy hair growth cycle again after Chemotherapy or hair transplants. Zinc and Selenium, which work well together; Zinc plays a vital part in many bodily processes and functions such as in cell reproduction, hormonal balance, proper absorption of vitamins, and in protein synthesis. All these processes are vital for proper hair growth such that an adequate amount of this mineral is needed to prevent hair thinning and loss. They both are reported to have antioxidant properties and help your body maintain its’ proper functions such as hair growth. It is said that a deficiency in either Zinc or Selenium could contribute to poor hair health. It is worth researching each ingredient individually as each, in their own right have so many health benefits, not just for hair growth. It is also important to keep a healthy, balanced diet and lifestyle and drink plenty of water (Approx 4 pints per day). Try to dry hair naturally or use a low heat setting. Due to the natural growth cycle of the hair it is recommended to use hair care supplements for at least 90 days to see notable results. Information provided in the Q & A is opinion of the consultant. If you require medical advice, please see your healthcare practitioner. Should we use your Question in media, your name and details will remain confidential and not be shared with anyone else.